If you have been introduced to a notification presented via global-technical-solutionz.net, you should NOT follow the instructions. If you call the number presented by this scam, it is likely that you will lose a lot of money. Unfortunately, many users follow the instructions, because the fictitious notification manages to block their web browsers. Our researchers have found a way to remove global-technical-solutionz.net notifications from your browser. Please continue reading to learn how to delete this malware. The clandestine browser locker is operated using a Java exploit. If you visit a corrupted website, the malicious global-technical-solutionz.net notification will be automatically loaded, and you will not be able to close the fake warning or your browser. Unfortunately, many users do not even realize that they need to remove global-technical-solutionz.net notification from their browsers, because the information presented via this notification is quite intimidating. Of course, Trojan.FakeAV-Download, Spyware.BANKER.ID, and other threats that supposedly require removal are bogus, and you do not actually need to delete them! Apple Identify Theft & Intrusion Possibilities. Contact emergency Virus/Malware support now. Your personal and financial information might be at risk call +1-844-482-4909 for security check. Even though the global-technical-solutionz.net notification is identified as a critical security warning, we can assure that you need to delete it without any hesitation. If you suspect that malware has infiltrated your operating system, we suggest inspecting your PC and removing malware (if it exists) after you delete global-technical-solutionz.net notifications. Luckily, you do not need to remove global-technical-solutionz.net-related computer infections. As long as you do not go back to the infected websites and protect your operating system with a reliable security system, it is unlikely that you will need to worry about the removal of global-technical-solutionz.net notifications in the future. In order to delete global-technical-solutionz.net notifications, you need to kill your browsers. If you follow our manual removal guide below, you will terminate the process of a browser representing the fake notification. Once you re-launch your browser, the notification will be gone, and you will be able to go back to using your operating system and browsers in a regular manner. It is most likely that you will need to follow these removal instructions even if you call the provided number and give up your savings. Simultaneously tap Ctrl+Shift+Esc (or Ctrl+Alt+Del) to launch Task Manager. Click the Applications tab and select the blocked browser. Click the End Task button and exit Task Manager. Launch your browser and install a reliable security tool to block access to malicious websites in the future. N.B. Your virtual security will remain vulnerable until you install a reliable security tool. This tool will patch all security vulnerabilities and will block access to malicious or corrupted websites. 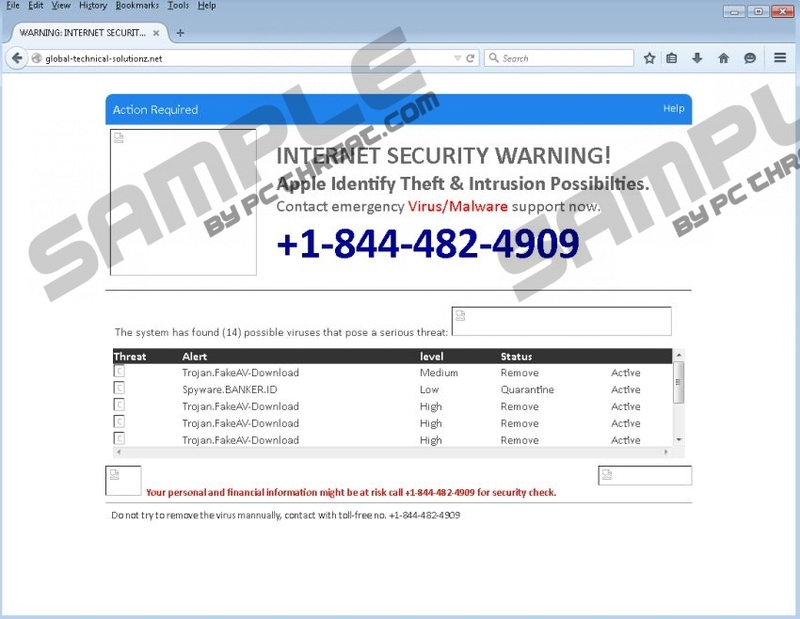 Moreover, this tool will also help you remove already existing malware. Quick & tested solution for global-technical-solutionz.net removal.